I created a poll on the Emily Bites Facebook Page this week asking my readers what you’d like to see more of on the blog and “crock pot recipes” was the runaway winner. Your wish is my command! 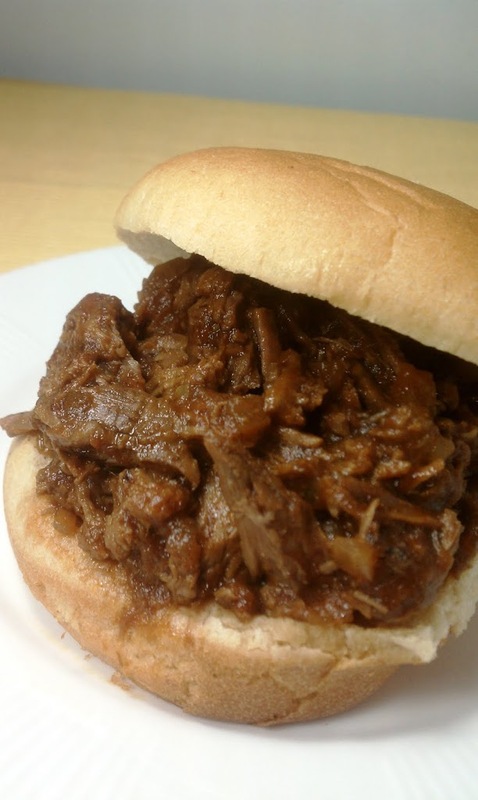 Slow cooker recipes are great because most have minimal “hand’s on” cooking time and often they can cook all day and be nearly ready when you get home from work! 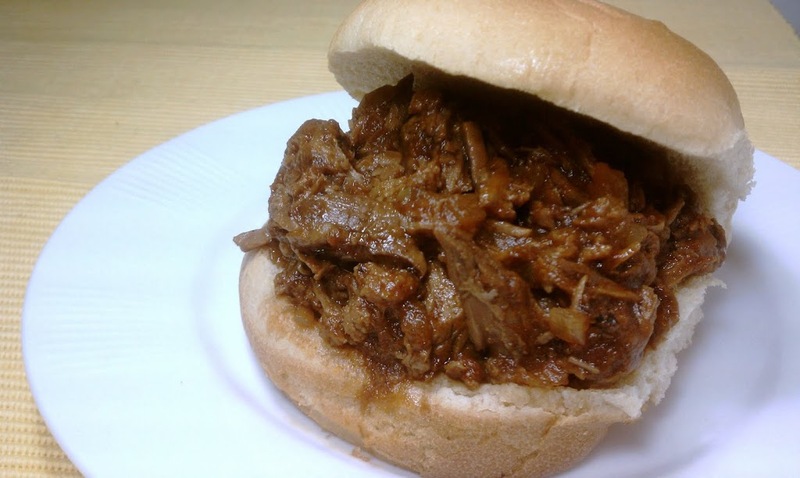 This hearty, tangy, tasty Barbecue Beef recipe came from my mom, who got it from her mom. Not only is this recipe easy and delicious, it’s also very versatile. I stayed traditional by serving the beef on a bun, but feel free to be creative! This Barbecue Beef would taste great atop a baked sweet potato, wrapped in a corn tortilla like a taco or featured on a nice crisp bed of salad. The possibilities are endless! Mist the inside of your slow cooker’s detachable pot (or other pot if your slow cooker doesn’t say the pot is oven-safe) with cooking spray and brown beef on all sides on the stove top. Do not cook beef all the way through. Add chopped onion and continue to cook until golden. Transfer pot (or contents of pot) back onto your crock pot base and add all other ingredients. Stir to combine. Turn crock pot temperature to medium and cover. Cook for 7-8 hours. Remove meat and shred it using two forks. Return shredded meat to the sauce and stir to combine. Turn heat up to high to allow sauce to thicken and cook for an additional 45-60 minutes. Serve! I didn’t have apple cider vinegar and I’m being lazy – so I will let you know how this turns out..we shall see! I’m certainly not offended, adapt away! Let me know how it turns out! Silly question here. Recipes says to turn crockpot temp to medium. Mine only has a low and high setting; how do you suggest I adjust the recipe for these settings? Hm, honestly I have never used a crock pot that didn’t have a medium setting, so I’m not exactly sure! I suppose you could probably just cook it for less time on high? Made this during the weekend. Mr. T. loves it! Had shared info with your mom on Facebook and she said we’d like it! My slow cooker only has a low and high setting, also. I started the cooking on HIGH to get it up to temp and then reduced to LOW for the last 3 hours. It turned out just fine. I’m not sure if you’ll see this but…any substitution ideas for apple cider vinegar? I have balsamic, red wine, and just plain white distilled. Not sure, I’ve only tried it the way I posted it. I’m guessing the red wine vinegar would be good! I just love the taste of barbecue beef. I always order barbecue flavored burger from Burger King. I’ll take note of this recipe and I’ll add them in my list. This is just so mouth watering. I never saw a dish this beautifully decadent. There is just something about barbecue that makes me so happy to eat it. I had to sub white wine vinegar but this turned out so good! Thanks for another great recipe. The kids are especially crazy about this. I made this last night and it’s a keeper for sure!!! I had mine on a “Sandwich Thin” and it was perfect! Tonight, I’ll try it on a sweet potato…can’t wait to share this one! Just came home after setting this up before I left this morning. The good news is the house smelled amazing. The bad news is the sauce was all dried up and the meat may not be salvageable. I browned the meat and carmelized the onions and then cooked it with the sauce for 8 hours. It turned out to be a hairline crack in the crock that cause a huge leak. Time for a new Crock Pot and to try this recipe on more time. Does the 5 points plus account for a bun also? Yum, this was great! My crockpot doesn’t have a medium setting, so I cooked it on low for about 10 hours. Will definitely make again. Thanks! There is no need to brown the meat, at least in my opinion. I threw everything in the crock pot this morning, with the meat still frozen because I forgot to thaw it. It turned out perfect. The only changes I made we to add about a clove of minced garlic and just a dash of red pepper. I cooked it on low for about 10 hours then shredded, left it on low for about 30 minutes more. I always leave the lid OFF the crock pop when shredding to let sauce get thicker. this sounded great until i tried putting my crock pot insert on my stovetop. It exploded! Well I put my Crock Pot insert on the stove pot and it’s now in the trash – it almost exploded. I don’t suggest ever trying this method – just dirty a pan! Like I said in the directions, my slow cooker pot is specifically meant to go from stovetop to slow cooker. Definitely use a separate pot unless yours is as well! If it doesn’t specifically say it can be used on the stovetop, I wouldn’t assume it can. I’m sorry to hear that happened to you. I hope you’re able to try this recipe again!